Astrophotographer Justin Ng took this image of the so-called Superwind galaxy NGC 4666 from Singapore on Jan. 2, 2015. This stunning image shows a bright supernova in the Superwind galaxy taken on Jan. 2 by a night sky photographer in Singapore. The supernova, called ASASSN-14lp, was discovered in early December and photographed here by veteran astrophotographer Justin Ng. "This Type la supernova is located in the spiral galaxy, Superwind galaxy, in Virgo that is approximately 80 million light-years away from Earth," Ng wrote in an email to Space.com, adding the image is the result of a 2-hour exposure. Type Ia supernovas are generally thought to originate from white dwarf stars in a close binary system. 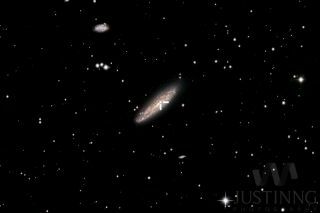 The Superwind galaxy NGC 4666 is a starburst galaxy where intense star formation is taking place. A combination of strong winds from massive stars and supernova explosions create a continuous flow of gas from the galaxy.